"as long as you think you're having a good time"
either way, I know that I had a good time. The weather turned out to be perfect - no snow, or rain. I was a little fearful that it would actually be too hot - but wasn't, and there was a nice breeze. 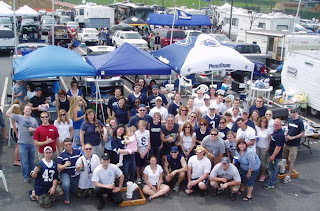 We had a huge turn out and many old (and new) friends made the trip to State College for the festivities. We had tailgaters from Virginia, Maryland, Alabama, Tennessee (what is going on here? ), Florida, Connecticut and all over the Commonwealth. We pulled into the parking lot a little before 8am (because, of course, the lots were open before 8) and headed home around 10pm. Our youngest tailgater was little Lilly Mae - who is just 3 months old - and the cutest little puppy I've seen in a while! more that I can't remember right now. My, personal, favorites this year were the Carolina bbq sandwiches (which we served pre-assembled on mini potato rolls with pickles and coleslaw) and the beer can chicken - which are always great - but the cayenne cinnamon birds were something special. One casualty was my super favorite football field tray - it didn't survive the dirty dish bag :( it will be missed. The tailgate was fabulous - the food, weather and atmosphere were near perfection. Now, we did have some organization troubles (hence the "practice" moniker) - and the very start of the day was a bit tense (if you are going to "make up" parking rules - then post them or let the people answering the phone know) - it was fine; it was okay - thankfully Suz can count. Sat in the PACKED stadium for the first half - got to see Stephon Green's run. Which was, no doubt, great, but, against our (supposed) #1 defense. I was watching the game with my goddaughter, who is 3 1/2. She could not wait to go into the stadium. We ran down to the endzone to see the Nittany Lion - when he was right in front of us, she turned around and asked me "can I touch his teeth?" BTW, it is amazing to me the number of GROWN MEN (I'm sure that grown women would as well, there just weren't any) who will crush a 3 1/2 year old in order to get a picture of our mascot. I didn't take the camera - so I am dependent on others to send me pictures - I will post some as soon as I can. Heading home to pack the car and head up to State College. of work for me - okay - 1 1/2 - I'll be heading up to State College Thursday (some time) in order to have all of Friday to prepare for the tailgate. Hopefully we'll see you there. Again, we'll be tailgating in the West parking lot under the pressbox. We're meeting at the NLI to drive in at 0700 - so we'll be at the gates by 0800 - I expect that the breakfast treats will be available by 0803 with full breakfast fare to follow soon after. homemade (yes, homemade) barbecue sauce. There's a lot to be done before Saturday morning - but we're on our way. AccuWeather's Saturday forecast is (currently) "Mainly Cloudy and Warm" - with a high of 72 degrees. I'm guessing that it's not going to snow. And I think that you all know why. When I was a child, I had a kiddie album (yes, it was pre-CD) titled "Candy Man" - it was a musical story based on (rip off of) Sammy Davis Jr's hit - not a crazed serial killer. I'll never be able to smile. I guess it's not my style. I'll never be happy again! Prompted by a super nice email asking if I knew the particulars regarding handicap parking for Blue White - I called the Athletics Department (because, at the time, I didn't know) to get the information. Handicap Parking will be in the first 5 rows of the South Parking lot and available on a "first come, first serve" basis. The lot will be accessible off of Porter Road. There will also be some handicap parking available by the Bryce Jordan Center. From there Fans have easy access to the stadium, BJC and other events/attractions - such as our tailgate - in the West Lot! So - in two weeks we'll be in State College, preparing for the Blue White game - everyone prepares in different ways - whether it be driving down Rte 322 (ooh, the Narrows isn't narrow anymore), sipping LIITs at Cafe 210, shopping at Wegmans for kielbasa and Middleswarth Potato Chips, heading over to SBS to check out the new array of sweatshirts and golfing accessories, or finishing up the last items for the tailgate... I can't wait. Last year I got to "show off" Penn State (again) to my little godchildren - I had the best time. The other day the girls were visiting me at the office and I asked the older one (now 5) if she remembered walking on Campus singing the "Penn State Song" - she answered, Does it go..."Penn State's Great! Penn State's Great!" (complete with jumping up and down). I said "No, but it should". I reminded her that we were singing the song together as we walked up to the Creamery. She looks at me and says, very seriously, "Oh, I remember the Creamery". So, Accuweather has that 15 day weather forecast - and, currently, Friday the 18th is the 15th day - and... the predicted weather for Friday, t'ain't great - High of 48 with rain in the PM. This can, of course, change - we'll see. Per PSU, via the Tailgating Coordinator, overnight RV parking will be available for the Blue White Game - but it doesn't open until Friday - the lot, the same one for regular season games, is accessible off of Orchard Road (enter from Park Ave), behind the Ag Arena (and in front of ADL). The cost is $50. Our RV brigade will be utilizing alternative parking options for Friday night and will join the game day (morning) convoy into the parking lots. Just 18 days to go!